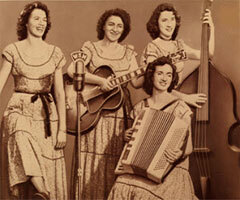 Groupe féminin Country US formé en 1943 et composé de Mother Maybelle Carter et de ses filles Helen Carter, June Carter et Anita Carter. 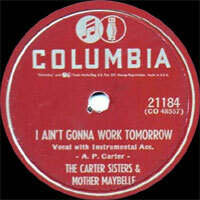 En 1960, Mother Maybelle renomme le groupe en Carter Family. 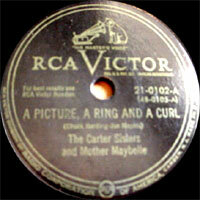 An offshoot of the legendary Carter Family, the Carter Sisters consisted of Helen, June, and Anita Carter, the three daughters of original Carter Family member Maybelle Carter (with whom they often performed) and Ezra Carter. Helen, June, and Anita all made their performing debuts with the Carter Family as young girls, with the elder two starting in the mid-'30s. When the original Carter Family lineup officially disbanded in 1943, Maybelle gathered her daughters into a new group dubbed Mother Maybelle & the Carter Sisters, built around Helen's musicianship, Anita's lead Vocalss, and June's gregarious, comic stage presence. They quickly became radio regulars in Richmond, VA, performing on two prominent stations through 1948. That year, they moved to a radio station in Knoxville, TN, where they found a brilliant accompanist in guitarist Chet Atkins, then a young virtuoso just beginning to make his mark. The year 1949 took the family to Springfield, MO, for another radio engagement, and in 1950 they moved to Nashville to join the Grand Ole Opry, where they remained regulars for the next decade. During that time, both Anita and June went off on occasional solo ventures, and also served as duo partners for singers like Hank Snow and Carl Smith, respectively. Over 1956-1957, the group toured as Elvis Presley's opening act.